Tarot readers commonly believe that the future is fluid and absolute predictions of future events are impossible. Thus, when they interpret tarot card layouts, they focus on identifying the possible outcomes for person receiving the reading (called the "subject"), as well as examining influences related to the issue at hand. 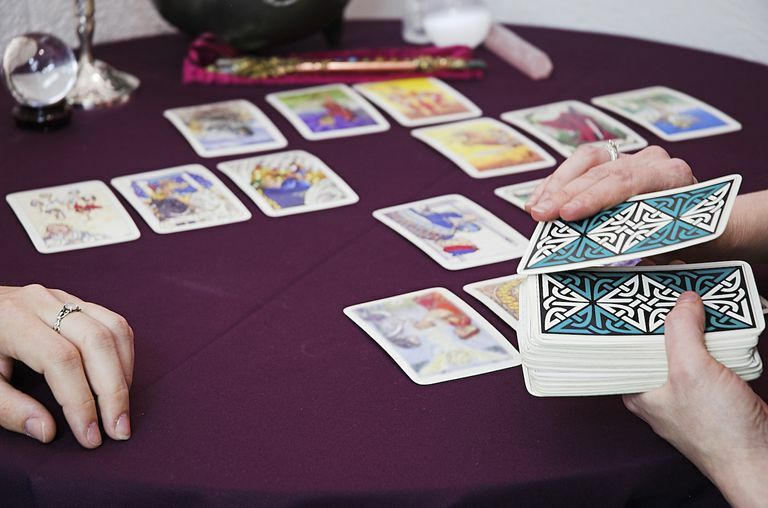 Tarot readings are intended to arm the subject with additional information so that they may make more informed choices. It is an avenue of research for subjects who face difficult choices, but should not be seen as any guarantee of ultimate outcomes. The tarot reader begins a reading by dealing a series of cards from the deck and placing them in an arrangement called a spread. Each card in the spread is interpreted by the reader based on its face value and position in the spread. The spread position indicates a different aspect of the question posed. Two of the most common spreads are the Three Fates and the Celtic Cross. The Three Fates is a spread of three cards. The first represents the past, the second represents the present, and the third represents the future. The Three Fates is one of many three card spreads. Other spreads cover a trio of topics such as current situation, obstacle, and advice to overcome the obstacle; or what the subject can change, what she can't change, and what she may not be aware of. The Celtic Cross consists of ten cards representing elements like past and future influences, personal hopes, and conflicting influences. The Minor Arcana are similar to a deck of regular playing cards. They are divided into four suits (Wands, Cups, Swords, and Pentacles). Each suit contains ten cards numbered 1 through 10. Each suit also includes face cards referred to as the page, knight, queen, and king. Different readers have different ideas of how the right cards for a given subject and her troubles are the ones that are dealt to the spread. For many psychics and magical practitioners, the cards are simply a medium to help trigger the reader's particular talent to sense a subject's situation and help her understand it. Other readers may speak of tapping into a "universal mind" or "universal consciousness." Still others credit the influence of gods or other supernatural beings to place the cards in a meaningful order. Some readers refrain from explanations altogether, acknowledging that they do not understand the specifics of how the tarot spread works but still believe that it does, in fact, work. Few readers would suggest that anyone could pick up a deck of tarot cards and produce a meaningful reading. Often, the cards are viewed as having no power at all and are simply a helpful visual cue to aid the reader. Others believe there is some power in the cards that accentuates the reader's own talents, which is why they will only work from their own decks.